Selling weapons to Mexico - where cartel violence is out of control - is controversial because so many guns fall into the wrong hands due to incompetence and corruption. The Mexican military recently reported nearly 9,000 police weapons "missing." Yet the U.S. has approved the sale of more guns to Mexico in recent years than ever before through a program called "direct commercial sales." It's a program that some say is worse than the highly-criticized "Fast and Furious" gunrunning scandal, where U.S. agents allowed thousands of weapons to pass from the U.S. to Mexican drug cartels. CBS News investigative correspondent Sharyl Attkisson discovered that the official tracking all those guns sold through "direct commercial sales" leaves something to be desired. One weapon - an AR-15-type semi-automatic rifle - tells the story. In 2006, this same kind of rifle - tracked by serial number - is legally sold by a U.S. manufacturer to the Mexican military. Three years later - it's found in a criminal stash in a region wracked by Mexican drug cartel violence. That prompted a "sensitive" cable, uncovered by WikiLeaks, dated June 4, 2009, in which the U.S. State Department asked Mexico "how the AR-15" - meant only for the military or police - was "diverted" into criminal hands. And, more importantly, where the other rifles from the same shipment went: "Please account for the current location of the 1,030 AR-15 type rifles," reads the cable. There's no response in the record. The problem of weapons legally sold to Mexico - then diverted to violent cartels - is becoming more urgent. That's because the U.S. has quietly authorized a massive escalation in the number of guns sold to Mexico through "direct commercial sales." It's a way foreign countries can acquire firearms faster and with less disclosure than going through the Pentagon. With Mexico in a virtual state of war with its cartels, nobody's tracking how many U.S. guns are ending up with the enemy. "I think most Americans are aware that there's a problem in terms of the drug traffickers in Mexico, increases in violence," said Bill Hartung, an arms control advocate with the Arms and Security Project at the Center for International Policy. "I don't think they realize that we're sending so many guns there, and that some of them may be diverted to the very cartels that we're trying to get under control." The State Department audits only a tiny sample - less than 1 percent of sales - but the results are disturbing: In 2009, more than a quarter (26 percent) of the guns sold to the region that includes Mexico were "diverted" into the wrong hands, or had other "unfavorable" results. The National Shooting Sports Foundation's Larry Keane, who speaks for gun manufacturers, said he understands the potential for abuse. "There have been 150,000 or more Mexican soldiers defect to go work for the cartels, and I think it's safe to assume that when they defect they take their firearms with them," Keane told CBS News. But Keane said the sales help the U.S.
"These sales by the industry actually support U.S. national security interests," Keane told Attkisson. "If they didn't, the State Department wouldn't allow them." "Do they need better oversight?" asked Attkisson. "It's certainly for the State Department and the Mexican government to try to make sure that the cartels don't obtain firearms that way," he replied. "But that's really beyond the control of the industry." 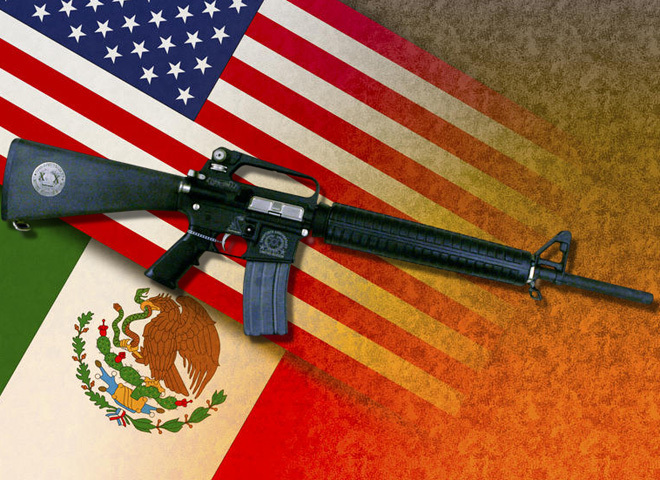 Mexico is now one of the world's largest purchasers of U.S. guns through direct commercial sales, beating out countries like Iraq. The State Department office that oversees the sales wouldn't agree to an interview. But an official has told Congress their top priority is to advance national security and foreign policy.